Win a date with a NYC firefighter at the City Reliquary Museum. HOT DATE: Got $50? You could pay your phone bill – or you could bid on a date with a bona fide member of New York’s bravest. 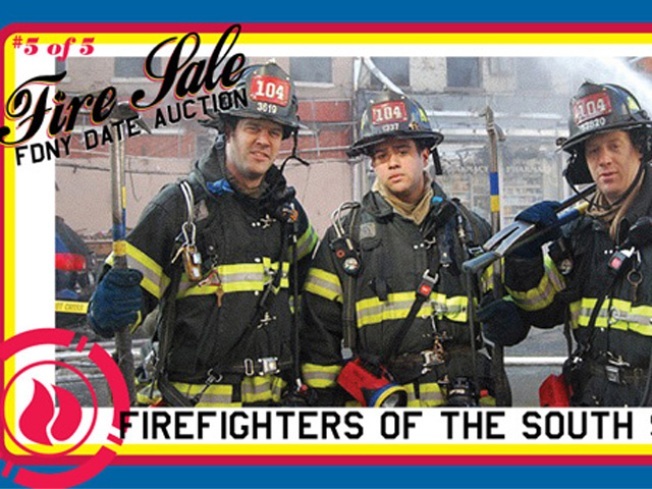 Best part: Your bid is tax deductible, because the Fire Sale Firefighter Date-Auction is a fundraising benefit for the history-of-NYC-devoted CityReliquaryMuseum. Come hobnob with the boys and squeeze a pec or two at the Knitting Factory, 6PM. NOT BREAD ALONE: It’s been a good five minutes without a Takedown! So thank goodness the folks who brought you the Taco T.D. and Chili T.D. are back with the Bruschetta Takedown, which doubles as a book launch party for Not Eating Out in NY’s Cathy Erway, whose “Art of Eating In” drops this week. Come to Bell House, eat tasty things piled on bread, cheer the competitors, and feel literary. 7PM. BRAND NEW: “Daily Show” correspondent Wyatt Cenac – the man behind such brilliance as “Rapper or Republican” – kicks off “Some Folks,” a new show in 92YTribeca’s Comedy Below Canal series. He hosts a hand-picked mix of special guests from the NYC comedy and music scenes, plus up-and-comers he just thinks are good. You should trust him. 9PM.